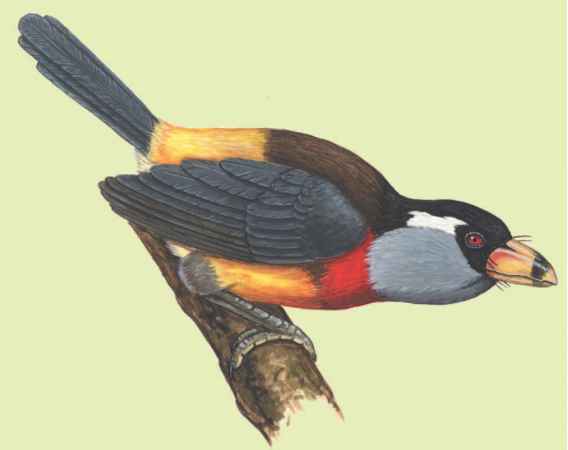 Physical characteristics: Toucan barbets are patterned and colorful birds with a short bill that is large at the base. Males have black around the bill base, a stiff black tuft on the nape (back of neck), and a broad white line behind the eyes. Females are similar to males, but do not have the stiff tuft on the nape. Juveniles are duller in color. Adults are about 7.5 to 9.8 inches (19 to 25 centimeters) long and weigh between 3.0 and 3.9 ounces (85 and 110 grams). Geographic range: They are found in southwestern Colombia and western Ecuador in South America. Habitat: Toucan barbets prefer wet subtropical forests and montane (mountainous) tropical forests, secondary growth, and forest edges and open pastures that contain scattered fruit trees. Diet: Their diet is made up of mostly fruits (sixty-two species of plants have been recorded), but they also eat insects and other invertebrates when fruit is limited or not available. Behavior and reproduction: Toucan-barbets are found around fruiting trees and bushes. They forage in groups of up to six birds, usually a territorial pair and their young. The birds hop on branches and climb through low bushy growth from about ground level to the forest canopy. They sometimes remain motionless on a perch. Their song is a series of short, foghorn-like notes repeated many times, such as "hawnk" followed by "ag." During this song, the tail is often cocked. A territory is found around a roosting and nesting hole in a dead tree. The breeding pair will drive away all visitors, including older offspring and other group adults, except for one or two helpers. The number of eggs laid is unknown. The incubation period is about fifteen days. 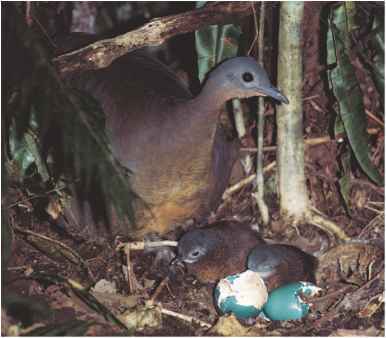 The male and helpers will help the female incubate the eggs. The young are fed for forty-three to forty-six days. If another brood is laid, the earlier offspring will help out. Toucan barbets and people: People may trap toucan barbets. del Hoyo, Josep, et al, eds. Handbook of the Birds of the World. Barcelona: Lynx Edicions, 1992. "Coppersmith Barbet Megalaima haemacephala." Delhibird: The Northern India Bird Network. http://www.delhibird.org/species/sp03557.htm (accessed on August 24, 2004).